Department of Medical Genetics, Faculty of Medicine, Ege University, Izmir, Turkey. Citation: Celenk FG, Sukatar A. Scytosiphon lomentaria (Lyngbye) Link has Both Hypoglycemic and Hypolipidemic Activity. Pharm Biotechnol Curr Res. 2016, 1:1. Scytosiphon lomentaria and Padina pavonica are the two members of the Phaeophyceae. Our study has reported that these two brown macroalgae exhibit the important biological potentials such as antioxidant, hypoglycemic and hypolipidemic activities. However, S. lomentaria exhibit potent antioxidant activities, it has been observed that P. pavonica has strong antioxidant potentials such as 251.56 ± 1.33 mg GA g-1 dw total phenolic content, 70.50 ± 1.4% DPPH radical scavenging activity and 60.6 ± 1.6% bleaching activity. In addition to antioxidant potentials, the species have not displayed significant cytotoxicity at the administered doses on MCF-7. Nevertheless, the highest dose for P. pavonica (100 µg ml-1) caused to moderate cell viability inhibition (43%). A meaningful IC50 value could not be calculated for S. lomentaria. Many enzyme inhibition tests are commonly used as indicator for biological activities. Both P. pavonica and S. lomentaria have higher α- glucosidase enzyme inhibition potential than acarbose. The strong inhibition percentages of these cold methanol extracts (89 and 88%, respectively) indicate their hypoglycemic activity. The pancreatic lipase enzyme inhibition assay was used to evaluate the hypolipidemic potentials of these microalgae. P. pavonica have strongly inhibited this enzyme when compared to orlistate (93 and 95%, respectively). These results have figured out the medical and pharmaceutical potentials of these species. Marine microalgae are known to be functional foods in Asian countries [1-4]. Due to their beneficial natural potentials, seaweed extracts have also been investigated for their biological activities [5-7]. Their low lipid content, high polysaccharides content and rich natural minerals  could create healthy diets for consumers [4,9,10] or present natural and non-toxic substances for researchers . Some disease such as diabetes or cardiovascular complications which have world- wide high incidence  require special treatments [13,14] and diets [15-19] with the aim of decrease the blood glucose and lipid level. Two member of Phaeophyceae, Scytosiphon lomentaria and Padina pavonica, have also had significant biological activities [1,20-25]. However, extraction studies of plants give complicated results depend on extraction conditions such as solvent, temperature and term , many natural compounds or molecules have already been identified [27-29] undergone their preclinical studies [30,31], even applied for patent . This study focuses on antioxidant activities and enzyme inhibition potentials of these two microalgae. The samples of Scytosiphon lomentaria and Padina pavonica were collected Izmir Gulf, from March 2011 to March 2012. Specimens in the labelled plastic bags were approximately 0.5-1 kg wet weight and immediately transported to the laboratory in cooled containers. To remove sand and epiphytes, algal thalli were gently rinsed in seawater. Taxonomic identification was done in terms of their morphology. Specimens had been stored at -20°C until experiments begun. The voucher specimens are preserved in the Herbarium of Ege University. Thalli were lyophilized and 1 g of powder was extracted with 10 mL of methanol by shaking in an orbital shaker at 300 rpm overnight at +4°C. Extracts were then centrifuged at 4000 rpm for 10 minutes and supernatants were collected. Collected supernatants were placed in orbital shaker and extraction was initiated again. This procedure had been repeated for 10 days. After 10 days of extraction/centrifugation cycle, solvent was removed by lyophilization and powders of the crude extracts were dissolved in DMSO (dimethyl sulphoxide; 10 mg crude extract per mL; Sigma-Aldrich, USA) to be stored at - 20°C for further experiments. Extraction efficiency was roughly evaluated by thin layer chromatography. Crude macroalgal methanol extracts were dissolved in methanol (1 mg ml-1). Individual samples were loaded four times on silica coated aluminum TLC plate as a dash. The solvent system of chloroform: ethyl acetate: methanol (5: 5: 1, v/v) was used and the dashes was visualized after dipping into hydrochloric acid/ methanol (1:9, v/v) and heating until they appeared as dark dashes. The total phenolic contents (TPC) of algal samples were determined by using Folin- Ciocalteu assay (Zhang et al.) in 96- well plates. Methanol extracts (10 mg ml-1) were loaded into 96- well plate containing 90 μl of deionized water and 10 μl 2N Folin- Ciocalteu’s reagent (Sigma-Aldrich, USA) in each well. Plates were incubated for 5 minutes at room temperature. After incubation 100 μl of sodium carbonate (7%) was added to each well. Plates were shaken in the dark at room temperature for 90 min. The absorbance of the formed colour was measured at 750 nm. All measurements were repeated three times and mean absorbance values were used to evaluate results. A calibration curve of Gallic acid (ranging from 0.010 mg ml-1 to 200 mg ml-1; Sigma-Aldrich, USA) was drawn, and the results were expressed as Gallic Acid (GA) mg equivalents’ ratio to dry weight (g). Where the A0 and A'0 are the absorbance values measured at zero time of the sample and the control, respectively, and A90 and A'90 are the absorbance values measured at 90 min of the sample and the control. All studied cell lines were kindly provided by Ege University Medical School Department of Medical Oncology. Breast cancer cell line MCF-7 was cultured in RPMI medium (Lonza, CH) with 10% fetal bovine serum (Lonza, CH) and penicillin-streptomycin (100 U ml-1; Sigma-Aldrich, USA) supplement. Immortalized mammary epithelial cell line MCF-10A was cultured in DMEM medium (Lonza, CH) supplemented with 10% fetal bovine serum (Lonza, CH), penicillin-streptomycin (100 U ml-1; Sigma-Aldrich, USA), EGF (20 ng ml-1 epidermal growth factor; New England Biolabs, USA), hydrocortisone (0.5 μg ml-1; Biochrom, GER) and insulin (10 μg ml-1; Sigma-Aldrich, USA). All cell lines were maintained in CO2 incubator with standard incubation conditions. Cells were treated with different concentrations of macroalgal methanol extracts reconstituted in dimethyl sulphoxide (DMSO; Sigma-Aldrich, USA) and diluted with proper media for viability experiments. For each experimental procedure, appropriate concentration of vehicle (DMSO) was used as a carrier control. Growth inhibitory effects of extracts were investigated via mitochondrial dehydrogenase activity by WST-8 colorimetric assay kit (Sigma-Aldrich, USA). Briefly, MCF7 cells were seeded in 96- well plate 10 × 103 cells per well and incubated overnight for both cell attachment and growth. Macroalgal extracts were added to wells in different final concentrations (0, 1, 5, 10, 25, 50 and 100 μg ml-1) with six repeats. Maximum DMSO concentration was 1%. After 72 hours of incubation, 10 μl of WST-8 reagent was added to wells and plates were incubated at 37°C for 15 minutes for the formation of color. Absorbance was measured at 450 nm on multi-well spectrophotometer. Untreated cell viability was considered as 100% and extract- treated cell viabilities were calculated accordingly. IC50 (inhibitory concentration 50) values were calculated using CalcuSyn v2.0. Where the Ae is the absorbance value of enzyme reaction and as is the absorbance value of extract added reaction. Whereas is the absorbance value of extract added reaction, Ac is the absorbance value of enzyme reaction. Scytosiphon lomentaria (Lyngbye) Link and Padina pavonica (Linnaeus) Thivy were collected with the Voucher IDs EGE41710 and EGE41834, respectively. Collection data about date, location and coordinates was presented in our previously study . TLC profiles of macroalgal cold methanol extracts are shown in Figure 1. The fingerprints exhibit the high abundancy of extracted molecules for these macroalgal samples. Our study has figured out high antioxidant, hypoglycemic and hypolipidemic potentials for cold methanol extracts for Scytosiphon lomentaria and Padina pavonica. Figure 1 TLC profiles of macroalgae. Scytosiphon lomentaria (at left) and Padina pavonica (at right). Antioxidant activities of macroalgal extracts are presented in Table 1. Commonly named as peacock’s tail, P. pavonica, has 251.56 ± 1.33 mg GA g-1 dw TPC, 70.50 ± 1.4% DPPH radical scavenging activity and 60.6 ± 1.6% bleaching activity. Whereas, in literature, other extractions types of S. lomentaria which had been used different solvent reported different DPPH inhibition rates such as 16.00 ± 1.13% for carbohydratic hydrolase and 19.33 ± 0.49 proteolytic enzyme extract , It has been reported that its methanol: chloroform extract  and ethanol extract  have low DPPH scavenging capacities. It has also been observed that different solvents used for extraction of this species cause lower yield for TPC [35,36]. It is quite apparent that these differences of antioxidant activity probably arise from the different collection dates, performing drying and/or milling, solvent selection and extraction term. Based on the interactions of compound being analyzed and solvent, this situation is generally valid for all kind of extraction studies. According to our results, P. pavonica has displayed both high TPC and DPPH inhibition rates. But it has been reported that its methanol and ethanol extracts exhibit lower TPC and DPPH inhibition rate than those our study . Same solvent but different yields for TPC probably are a result of the temperature. The colder temperatures during extraction protect the compounds of microalgae. As a summary, even if the parameters for the solvent type, the temperature and term of extraction are different, both S. lomentaria andP. pavonica have good antioxidant capacities. Table 1 Antioxidant activities of the Scytosiphon lomentaria (EGE41710) and Padina pavonica (EGE41834). The effects of macro algal extracts on viability of MCF-7 cells are depicted in Figure 2. At 100 µg ml-1 of their concentrations, both P. pavonica and S. lomentaria weakly inhibited MCF-7 viability. At the lower doses than 100 µl ml-1, S. lomentaria did not display a cell viability inhibition. While, IC50 value of P. pavonica was 320 µg ml-1, IC50 value of S. lomentaria was not determined. The methanol extract has displayed cytotoxic activities on Hela (IC50: 86.45 μg ml-1) and MDA-MB (IC50: 74.59 μg ml-1) cell lines . It has been reported that xenican diterpenes of P. pavonica methanol extract exhibits cytotoxicity on H460 cells (37.3%) and HepG2 cells (24.1%) at 10 µg ml-1 concentration . But, oxysterol of P. pavonica dichloromethane extract inhibits the viability of KB cells with the percentage inhibition of 100% . It is very clear that the solvent type, extraction conditions, extracted compound, administered doses and cell line selection affect the throughputs of cytotoxicity studies. An IC50 value could not be determined for S. lomentaria, in contrast our results, its ethanol: acetate fraction induced the apoptosis by way of the down-regulation of Bcl-2 and the activation of caspase on leukemia cells . Both Padina pavonica and Scytosiphon lomentaria have higher α- glycosidase enzyme inhibiton potential than acarbose. According to the measurements, positive control acarbose inhibited 79.5 percentage of α- glucosidase enzyme activity. But, the inhibition rates of macro algal extracts were higher than this value. In spite of the fact that both macroalgal extracts were subjected as crude material, P. pavonica and S. lomentaria strongly inhibited this enzyme, 89 and 88%, respectively. It has been observed that its polyphenols and phlorotannins could weakly inhibit α- amylase and - glucosidase than acarbose . Researchers have notified that its ethanol extract lead to ameliorate elevated levels of glucose, aspartate aminotransferase, lactate dehydrogenase and creatine kinase and decline serum insulin levels of Type 2 diabetic rats . Experiments showed that S. lomentaria also have same inhibition effect on this enzyme. This is the fact that both P. pavonica and S. lomentaria have strong-glycosidase inhibition potential is taxonomically important so that probably reflects seconder metabolite profile analogy. 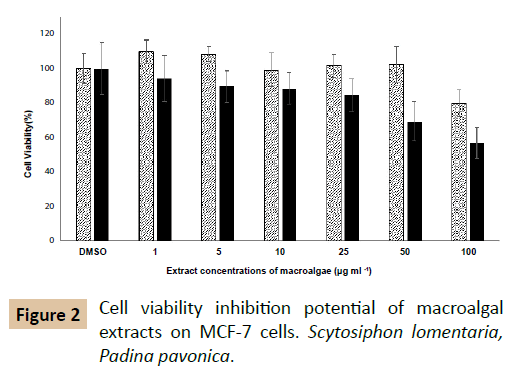 Figure 2 Cell viability inhibition potential of macroalgal extracts on MCF-7 cells. Scytosiphon lomentaria, Padina pavonica. The pancreatic lipase enzyme inhibiton percentages for the methanol extracts P. pavonica and S. lomentaria were measured as 93 and 68%, respectively. Orlistat was used as a positive control (95.2%). Our study presents the first results about hypoglycemic and hypolipidemic activity of S. lomentaria and hypolipidemic activity of Padina pavonica. These species should be considered as sources for anti-diabetic and anti- hypolipidemic substances. Kuda T, Tsunekawa M, Hishi T, Araki Y (2005) Antioxidant properties of dried 'kayamo-nori', a brown alga scytosiphon lomentaria (scytosiphonales, phaeophyceae). Food Chemistry 89: 617-622. Yuan YV, Carrington MF, Walsh NA (2005) Extracts from dulse (palmaria palmata) is effective antioxidants and inhibitors of cell proliferation in vitro. Food and Chemical Toxicology 43: 1073-1081. Yuan YV, Walsh NA (2006) Antioxidant and antiproliferative activities of extracts from a variety of edible seaweeds. Food and Chemical Toxicology 44: 1144-1150. Mohamed S, Hashim SN, Rahman HA (2012) Seaweeds: A sustainable functional food for complementary and alternative therapy. Trends in Food Science & Technology 23: 83-96. Smit AJ (2004) Medicinal and pharmaceutical uses of seaweed natural products: A review. Journal of Applied Phycology 16: 245-262. Montero L, Sanchez-Camargo AP, Garcia-Canas V, Tanniou A, Stiger-Pouvreau V, et al. (2016) Anti-proliferative activity and chemical characterization by comprehensive two-dimensional liquid chromatography coupled to mass spectrometry of phlorotannins from the brown macroalga sargassum muticum collected on north-atlantic coasts. J Chromatogr A 1428: 115-125. Syad AN, Rajamohamed BS, Shunmugaiah KP, Kasi PD (2016) Neuroprotective effect of the marine macroalga gelidiella acerosa: Identification of active compounds through bioactivity-guided fractionation. Pharm Biol 54: 2073-2081. Tabarsa M, Rezaei M, Ramezanpour Z, Waaland JR, Rabiei R (2012) Fatty acids, amino acids, mineral contents, and proximate composition of some brown seaweeds. Journal of Phycology 48: 285-292. Tierney MS, Smyth TJ, Rai DK, Soler-Vila A, Croft AK, et al. (2013) Enrichment of polyphenol contents and antioxidant activities of irish brown macroalgae using food-friendly techniques based on polarity and molecular size. Food Chemistry 139: 753-761. Cho S, Yang H, Jeon YJ, Lee CJ, Jin YH, et al. (2012) Phlorotannins of the edible brown seaweed ecklonia cava kjellman induce sleep via positive allosteric modulation of gamma-aminobutyric acid type a–benzodiazepine receptor: A novel neurological activity of seaweed polyphenols. Food Chemistry 132: 1133-1142. Mayer AMS, Rodriguez AD, Berlinck RGS, Fusetani N (2011) Marine pharmacology in 2007–8: Marine compounds with antibacterial, anticoagulant, antifungal, anti-inflammatory, antimalarial, antiprotozoal, antituberculosis, and antiviral activities; affecting the immune and nervous system, and other miscellaneous mechanisms of action. Comparative Biochemistry and Physiology Part C: Toxicology &amp; Pharmacology 153: 191-222. Whiting DR, Guariguata L, Weil C, Shaw J (2011) IDF diabetes atlas: Global estimates of the prevalence of diabetes for 2011 and 2030. Diabetes Research and Clinical Practice 94: 311-321.
da Rocha FJ, Ogurtsova K, Linnenkamp U, Guariguata L, Seuring T, et al. (2016) IDF diabetes atlas estimates of 2014 global health expenditures on diabetes. Diabetes Res Clin Pract 117: 48-54. Piepoli MF, Hoes AW, Agewall S, Albus C, Brotons C, et al. (2016) european guidelines on cardiovascular disease prevention in clinical practice: The sixth joint task force of the european society of cardiology and other societies on cardiovascular disease prevention in clinical practice (constituted by representatives of 10 societies and by invited experts) developed with the special contribution of the european association for cardiovascular prevention & rehabilitation (eacpr). Atherosclerosis 252: 207-274. Garcia-Toro M, Vicens-Pons E, Gili M, Roca M, Serrano-Ripoll MJ, et al. (2016) Obesity, metabolic syndrome and mediterranean diet: Impact on depression outcome. J Affect Disord 194: 105-108. Ruqqia K, Sultana V, Ara J, Ehteshamul-Haque S, Athar M (2015) Hypolipidaemic potential of seaweeds in normal, triton-induced and high-fat diet-induced hyperlipidaemic rats. Journal of Applied Phycology 27: 571-579. Kim MJ, Kim HK (2012) Insulinotrophic and hypolipidemic effects of ecklonia cava in streptozotocin-induced diabetic mice. Asian Pacific Journal of Tropical Medicine 5: 374-379. Scalbert A, Manach C, Morand C, Remesy C, Jimenez L (2005) Dietary polyphenols and the prevention of diseases. Critical Reviews in Food Science and Nutrition 45: 287-306. Montonen J, Knekt P, Jarvinen R, Reunanen A (2004) Dietary antioxidant intake and risk of type 2 diabetes. Diabetes Care 27: 362-366. Ktari L, Guyot MA (1999) Cytotoxic oxysterol from the marine alga padina pavonica (l.) thivy. Journal of Applied Phycology 11: 511-513. Kim SC, Park SY, Hyoun JH, Cho H, Kang JH, et al. (2004) The cytotoxicity of scytosiphon lomentaria against hl-60 promyelocytic leukemia cells. Cancer Biother Radiopharm 19: 641-648. Men'shova RV, Ermakova SP, Rachidi SM, Al-Hajje AH, Zvyagintseva TN, et al. (2012) Seasonal variations of the composition, structural features, and antitumor properties of polysaccharides from padina pavonica (lebanon) as a function of composition. Chemistry of Natural Compounds 47: 870-875. Silva J, Alves C, Pinteus S, Horta A, Pedrosa R (2013) High antioxidant activity of sargassum muticum and padina pavonica collected from peniche coast (portugal). Current Opinion in Biotechnology 24: S116-S116. Ismail A, Ktari L, Ahmed M, Bolhuis H, Boudabbous A, et al. (2016) Antimicrobial activities of bacteria associated with the brown alga padina pavonica. Front Microbiol 7: 1072. Park MH, Kim S, Cheon J, Lee J, Kim BK, et al. (2016) Effects of scytosiphon lomentaria on osteoblastic proliferation and differentiation of mc3t3-e1 cells. Nutr Res Pract 10: 148-153. O'Sullivan AM, O'Callaghan YC, O'Grady MN, Hayes M, Kerry JP, et al. (2013) The effect of solvents on the antioxidant activity in caco-2 cells of irish brown seaweed extracts prepared using accelerated solvent extraction (ase (r)). Journal of Functional Foods 5: 940-948. Shilabin AG, Hamann MT (2011) In vitro and in vivo evaluation of select kahalalide of analogs with antitumor and antifungal activities. Bioorganic & amp; Medicinal Chemistry 19: 6628-6632. Gross H, Goeger DE, Hills P, Mooberry SL, Ballantine DL, et al. (2006) Lophocladines, bioactive alkaloids from the red alga lophocladia sp. Journal of Natural Products 69: 640-644. Kubanek J, Prusak AC, Snell TW, Giese RA, Fairchild CR, et al. (2006) Bromophycolides c-i from the fijian red alga callophycus serratus. Journal of Natural Products 69: 731-735. Martin-Algarra S, Espinosa E, Rubio J, Lopez JJL, Manzano JL, et al. (2009) Phase ii study of weekly kahalalide f in patients with advanced malignant melanoma. European Journal of Cancer 45: 732-735. Rademaker-Lakhai JM, Horenblas S, Meinhardt W, Stokvis E, de Reijke TM, et al. (2005) Phase i clinical and pharmacokinetic study of kahalalide f in patients with advanced androgen refractory prostate cancer. Clinical Cancer Research 11: 1854-1862. 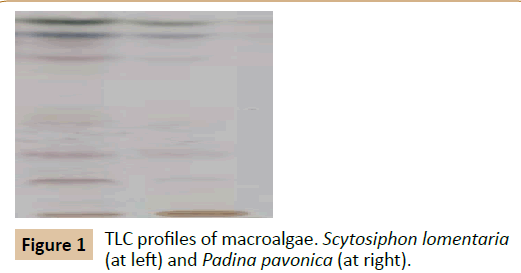 Rajendran P, Subramani PA, Michael D (2016) Polysaccharides from marine macroalga, padina gymnospora improves the nonspecific and specific immune responses of cyprinus carpio and protect it from different pathogens. Fish Shellfish Immunol 58: 220-228. Celenk FG, Ozkaya AB, Sukatar A (2016) Macroalgae of izmir gulf: Dictyotaceae exhibit high in vitro anti-cancer activity independent from their antioxidant capabilities. Cytotechnology 68: 2667-2676. Heo SJ, Park EJ, Lee KW, Jeon YJ (2005) Antioxidant activities of enzymatic extracts from brown seaweeds. Bioresource Technology 96: 1613-1623. Zhang WW, Duan XJ, Huang HL, Zhang Y, Wang BG (2007) Evaluation of 28 marine algae from the qingdao coast for antioxidative capacity and determination of antioxidant efficiency and total phenolic content of fractions and subfractions derived from symphyocladia latiuscula (rhodomelaceae). Journal of Applied Phycology 19: 97-108. Demirel Z, Yilmaz-Koz FF, Karabay-Yavasoglu UN, Ozdemir G, Sukatar A (2009) Antimicrobial and antioxidant activity of brown algae from the aegean sea. Journal of the Serbian Chemical Society 74: 619-628. Khaled N, Hiba M, Asma C (2012) Antioxidant and antifungal activities of Padina pavonica and Sargassum vulgare from the Lebanese Mediterranean coast. Advances in Environmental Biol 6: 42-48. Stanojkovic TP, Savikin K, Zdunic G, Kljajic Z, Grozdanic N, et al. (2013) In vitro antitumoral activities of Padina pavonia on human cervix and breast cancer cell lines. Journal of Medicinal Plants Research 7: 419-425. Awad NE, Selim MA, Metawe HM, Matloub AA (2008) Cytotoxic xenicane diterpenes from the brown alga padina pavonia (l.) gaill. Phytotherapy Research 22: 1610-1613. Husni A, Ustadi WR (2014) Inhibitor activity of α- Amylase and α- Glucosidase by Padina pavonica Extracts. Journal of Biological Sciences 14: 515-520. Mahmoud AM, Germoush MO, Elgebaly HA, Elsayed KNM, Hassan S (2014) Antidiabetic and insulin sensitizing effexts of Padina pavonica and Turbenaria ornata in streptozotocin/ nicotinamide diabetic rats. 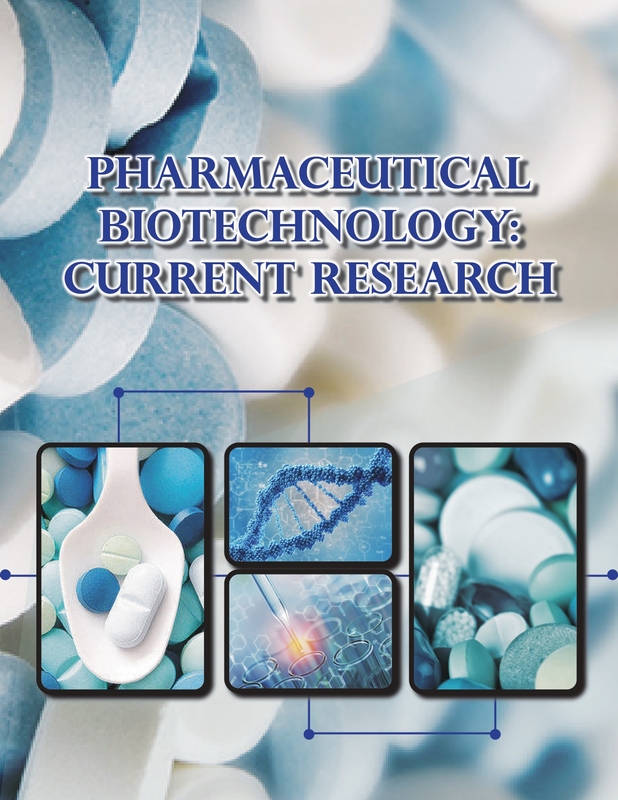 Asian Journal of Pharmaceutical and Clinical Research 7: 74-78.